Magento and Shopify are two of the biggest eCommerce platforms on the market. Many people ask us which one is better and to be honest – there isn’t a simple answer to the question. It all depends from your background, the way you approach business, the money you’re willing to invest and the features you expect. 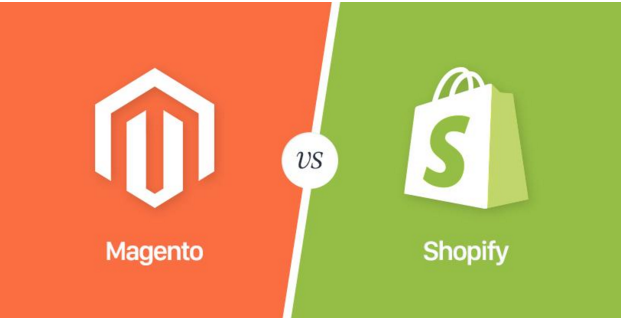 In this post we’ll make a complete comparison between Magento and Shopify so you can understand the pros and cons of both platforms. One of the first thing you will look at when choosing an eCommerce platform is the features that they offer. Basic online functionality – both platforms Magento and Shopify offer some great functionality. When being compared, it looks like Magento has a lot more features. 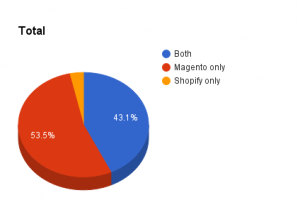 43.5% of the features are available only for Magento and 43.1% for both platforms. Shopify only features account for 3.2%. Inventory management – Shopify and Magento both offer unlimited number of items you can list in your store. It’s important to note that with Magento you should be careful when adding too many products. The reason is because your host (server) and site loading speed might suffer. That’s why you need to have a proper structure and know how to scale your store. With Shopify you won’t have that problem because it’s a fully managed and hosted solution. Themes and templates – Magento offers much larger pool of free and paid themes and templates to choose from. Magento paid themes also tend to be less expensive as their pricing starts from $1 and for Shopify this is $80. At the same time, the themes offered by Shopify seem to be more user-friendly and contemporary. Both platforms have mobile-friendly and responsive themes so you don’t have to worry about the user experience of your mobile users. Apps and Add-ons – Magento beats Shopify when it comes to the number of apps and add-ones as well. By June 2016 The Magento Extension Marketplace has way over 9486 apps and the Shopify App Store has only 539. This is probably a result of the open-source environment of Magento that encourages developers to create more tools for the platform. Multi-lingual capabilities – if you want to create a website in several languages, you will encounter some serious troubles with Shopify. The platform does not allow you to do that directly and you will need to purchase third party apps in order to make this possible. Another option is to custom code your themes, however this might not be an easy job. On other hand, Magento has a buildup multi-lingual support making things way easier for you. Blogging functionality – the option to create a blog is an integrated feature in Shopify and it is pretty easy to set up. In order to create a blog in Magento you will need to use some free plug-ins which might be some additional work to be able to set it up. User interface – both platforms come with a fairly easy to user interface and dashboards. It seems like Shopify is a step ahead when it comes to usability. Setup/installation – Shopify has a wizard mode that allows even novice users to setup an online store in no time. Basically, you can create your eCommerce sites in minutes and start selling. On the other hand, setting up your Magento store is not that easy and most people won’t be able to do it by themselves. This means that you probably need to hire a Magento developer to do that for you. You also need to think about hosting, something that is included in the Shopify package. Flexibility – Magento is an open-source platform that gives you a lot more flexibility as you can change it the way you want to. You can develop it yourself and add new features. That way you might not need to pay for apps. However, that might take more time and resources and turned out to be more expensive than buying an existing app. On the other hand, Shopify is a closed platform and you can’t change it that much. Still you can develop your own apps and even upload and sell them on the App store. Shopify provides you with 24/7 support that can help you any time with your store. You can communicate with them by phone, email and chat. They also have very powerful support center that can additionally answer your questions. Unfortunately, Magento Community edition does not provide you with any support. So you need to deal with your problems yourself. The only thing they offer is a community support from other developers that might give you some valuable answers that will help you find a solution to your issues. Vendor support for Magento is included only in the Enterprise edition. Everybody needs hosting and security to run an eCommerce site. It’s interesting that Magento and Shopify have very different approaches when it comes to this. Hosting – Shopify take care of the hosting for you. They even give you a free domain name that you can use to setup your website. This make it way easier to setup an eCommerce website but it comes with their monthly costs. On the other hand, Magento Community edition might be free but you need to find and setup your own hosting. At the same time the cheapest packages might not work for you so you might need to buy at least a dedicated server to run your online store smoothly. Additionally, for Magento you might need to purchase a CDN. Security – since Shopify provides with you hosting they also take care of the security – you can your SSL certificate, automatic backups and Level 1 PCI compliance. Magento is also PCI Certified and SSL security support is offered for the front and backend. Both Magento and Shopify offer great tools and features that allow you to market and sell to your customers. SEO capabilities – both platform offers some very powerful features when it comes to optimizing for eCommerce store for search engines. Magento provides you with some cool features like SEO friendly URLs, meta info, a Google sitemap, handy Google Content API for expanding your SEO efforts. Shopify on other hand has all the basic features that you need like robot.txt and sitemap.xml files, canonical URL tags to avoid duplicate content, editable meta descriptions, title tags and URLs. Both platforms integrate easily with Google Analytics so you can track the traffic that you generate from search engines. Social media features – Unfortunately, Magento doesn’t provide you with any social media features. However, you can integrate additional apps to get the functionality that you want. Shopify is a step ahead since they offer the option to sell products on Facebook and Pinterest. At the same time, in case you want to add social media buttons and integrations you will need to use additional app for that. Newsletter – Magento offers a newsletter subscription service that is way superior to the one of Shopify. You can integrate their system with coupon codes and made promotions straight away in your newsletter. A lot of people might prefer to use an external solution – like MailChimp or GetResponse to send better designed emails. The solution of Shopify allows you to create your own signup forms. The build in subscription management is not great so you will probably need additional app to send emails. Build-in promotion options – Magento wins here because it offers build-in features such as upselling, promotional pricing, flexible coupons, related products, free shipping, product bundling, etc. Additionally to that, you can use apps to get more promotional functionality. For Shopify the discount codes and coupons are included but you will need to purchase separate apps for other functionalities. 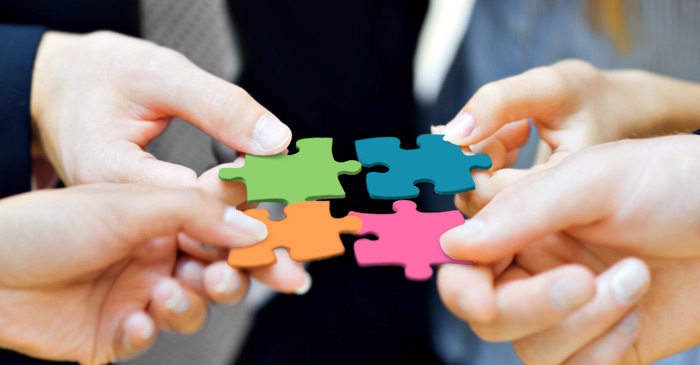 Support of other selling channels – both Magento and Shopify allow you to integrate and easily sell on other channels. Magento has customer coding and the apps from the Magento Extension marketplace can help you integrate and sell through other channels. You have a Google Shopping API, however you will need some developer experience to set it up. With Shopify you can also easily sell through Google Products and the integration will require some help from developers as well. You can also use app to sell on places like Amazon and eBay. 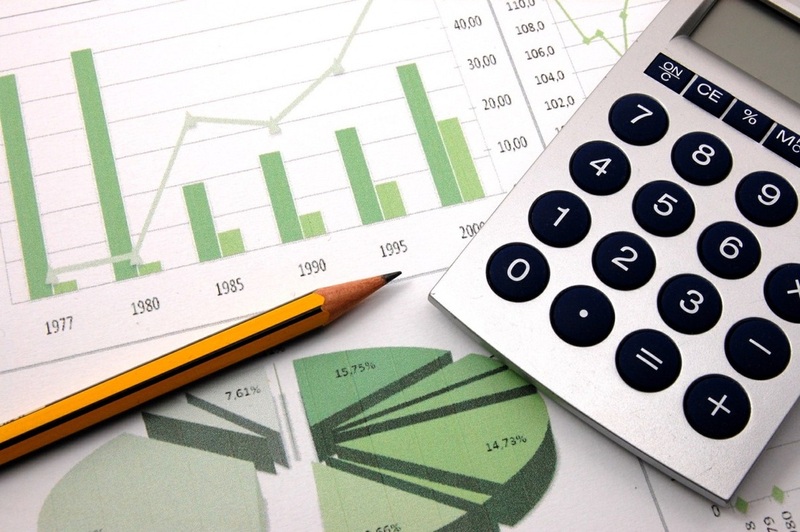 Analytics & Statistics – Magento provides you with more sophisticated and comprehensive reports. At the same time they might be more complex. You will see details about sales, taxes, refunds, invoices, low stock reports, abandoned shopping carts, product reviews, best viewed products, etc. There is also information about what keywords people use to find your site and products. You will also see a great summary of your stats in the dashboard. The Shopify reports are simpler and easier to understand, however they don’t include some much information. You will see stats about gross sales, traffic from locations, landing pages, referrers, devices, etc. Gross sales are broken down by traffic referrer, SKU, product title and more. Setup fees – Shopify does not charge any setup fees. At the same time, they have a 14-day free trial so you can create your eCommerce store and test out the features before you decide to purchase. Magento Community edition is free to there are no setup fees with that. However, you will probably need to hire a Magento develop to help you create your eCommerce store. The other thing is that you will need to pay for your own hosting and domain. Without that you can’t launch your site. Additionally, Shopify Plus is offered for Enterprise-level clients. All plans come with unlimited number of products, file storage, free hosting, domain name and SSL certificate. Magento Community Edition is free but you will need to pay for your own hosting and the pricing might vary between $5-$100/month depending on what you need. Magento Enterprise edition cost $18,000 per year and also you will probably need developer support each month. You can find a good Magento developer for about $15/hour. Bandwidth fees – Shopify does not charge you any fees for bandwidth. For Magento this will depend on your hosting provider. Transaction fees – in case you use Shopify’s payment gateway, they won’t charge you any transactional fees. 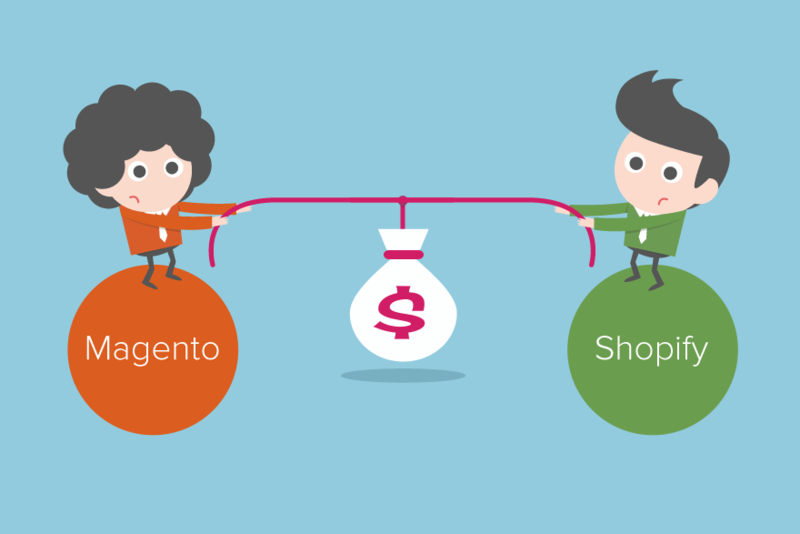 With Magento you will be charged transactional fees based on the payment gateway that you use. These fees may vary depending on the solution that you use. Theme/template prices – both platforms offer tons of free and paid themes and templates (with Magento having more options). The paid Magento themes are sold for much lower price – starting from just $1. For a paid Shopify theme you will need to spend much more as pricing starts from $80. Shopify is an easier to setup and use solution. It saves you the time and the hustle so you don’t have to think about hosting. They also provide you with amazing support and are always available for you. At the same time, it is a closed platform and you can’t make that many changes as you want. Also, there aren’t that many apps on the App Store. Magento on other hand is an open source platform is more flexible. You have full control to create your eCommerce site the way you want to. The build-in marketing functionality is superior to the one of Shopify. Also there are more apps you can use for additional functionality. The bad thing is with the Community edition you don’t get any support and if you want that – you will need to purchase the Enterprise edition. Overall, we believe Magento give you more options, however with it you will most probably need help from experts to run things smoothly.